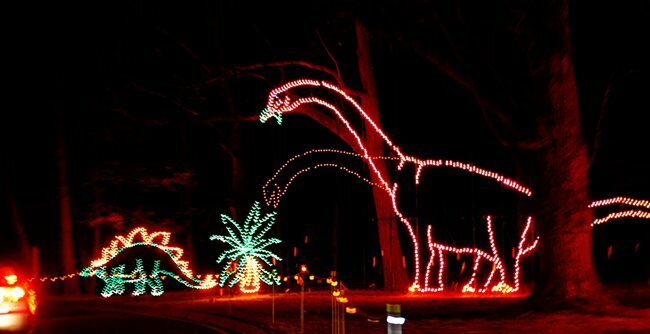 Each display is separate, a diorama showing holiday themes, characters from Dr. Seuss, or dinosaurs, often with “animations” made by having a series of bulbs flash in sequence. 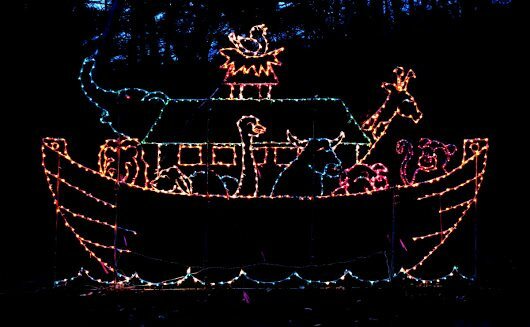 Managed by the Spirit of Springfield, a non-profit, it’s a delightfully noncommercial alternative to Six Flags New England’s Holiday in the Park, although they are so close by that you can (and should) visit them both in the same night. At the start of the season next year you can join in a road race through the park. Turning on your radio is a must. 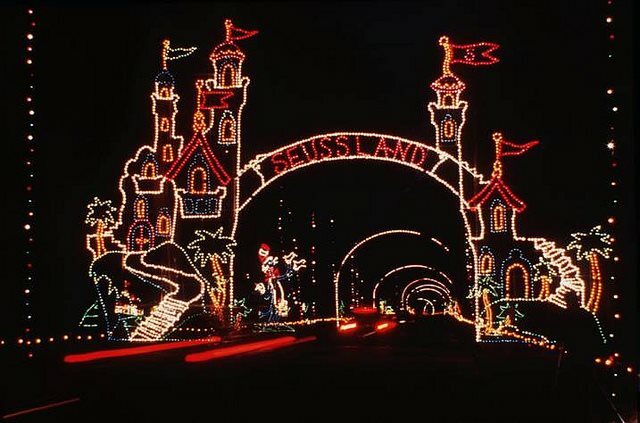 They broadcast “Elf radio” with holiday jingles and Santa fun as you drive. 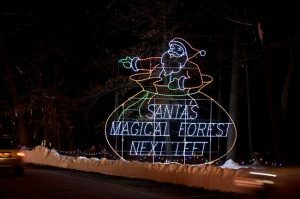 Make sure to stop at Santa’s Magical Forest, a rest stop on the left where you can park, get out of your car, and walk around. There you can take photos with Santa, ride the merry go round and other kiddie ride, and get hot chocolate, hot cider, coffee, pretzels, fried dough, chicken tenders, kettle corn, cookies, and drinks. I burned myself on the hot hot cider. Be careful. You can even join Santa for supper some Sundays. You can even spend $10 to take a horse-drawn wagon ride through the park. The park itself is beautiful at night. You’ll pass by a lake and feel the serenity of the seemingly endless night beauty. The wait wasn’t long and there’s plenty of parking in Santa’s Magical Forest. If you stop briefly in the Santa center, it’s a long experience, too: 45 minutes. December 13 you are invited to decorate your car with lights as you drive through. Bright Nights is just about perfect. As you enter, you’ll find Hanukkah and Kwanzaa displays, to put you at ease if you’re not Christian. The songs on the radio aren’t religious and the event is secular except for innocuous baby manger and Three Wise Men displays. One criticism: I wasn’t happy to see a display for Noah’s arc. That’s creationism, an idea so unscientific and backwards that it fits poorly with well-educated, liberal Massachusetts, and brings the Spirit of Springfield across the line from representing a diverse community to promoting a specific religion. It seems like a small thing, but creationism has no place in a public park meant for everyone, and it gives power to creationists such as former Holyoke principal Barry Bacom, who added creationism to public school classes, which is unconstitutional. The display should be retired, to better welcome nonbelievers, those other faiths, and just about every Christian. I gave it a pass in my review four years ago, but now, let’s call that half a star. Overall, you will find much to delight in: a jumping frog, dinosaurs that move, the man from Monopoly, ice skaters, and so much more. For quality and quantity, it’s a delightful attraction. I’m glad to give Bright Nights 4.5 stars.